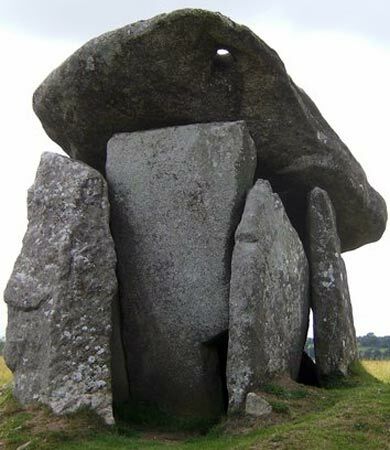 I am limiting myself here primarily to megalithic stones that would have required advanced technology in their making. 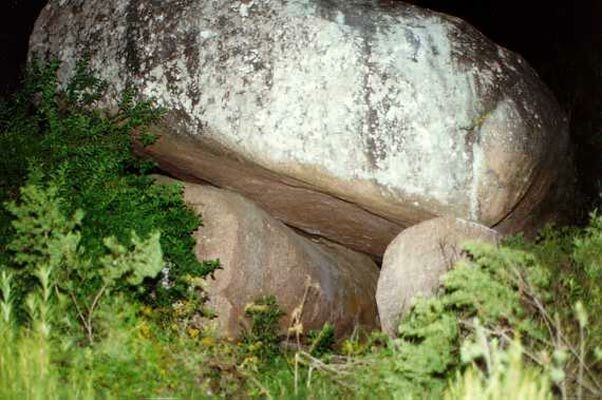 In each megalithic location unusual stones are found, unusual in terms of what we would expect from primitive societies. We find these kinds of stones in large number all over the world. 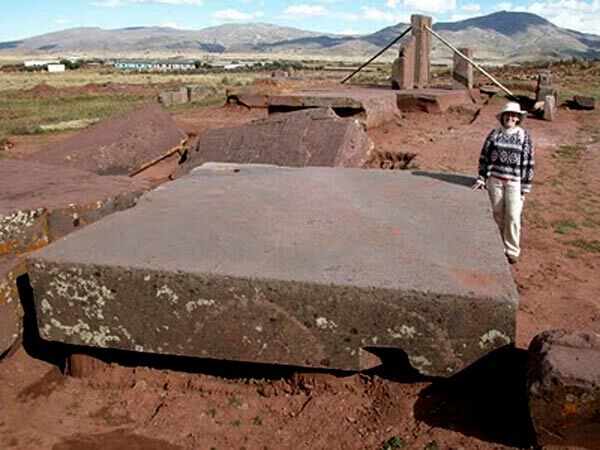 They are the remains of a worldwide society that had advanced technology to shape stone in many ways, in large sizes and had the ability to move them around easily. 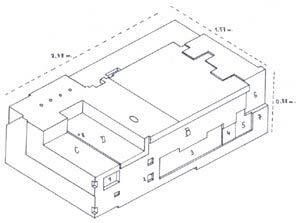 Following is an overview of this vast material of which you can find more on the internet. 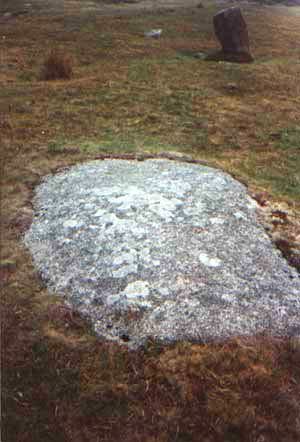 It is primarily based on my own visits to certain megalithic sites. 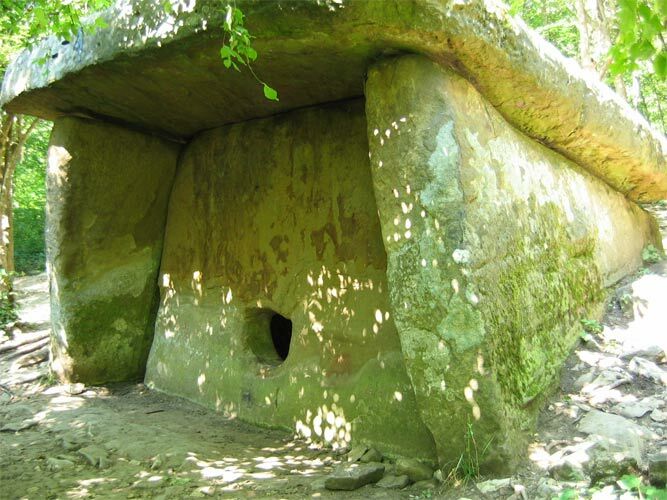 Megaliths, once thought to be work of a Mediterranean civilization, seem more to have been the work of a world civilization. 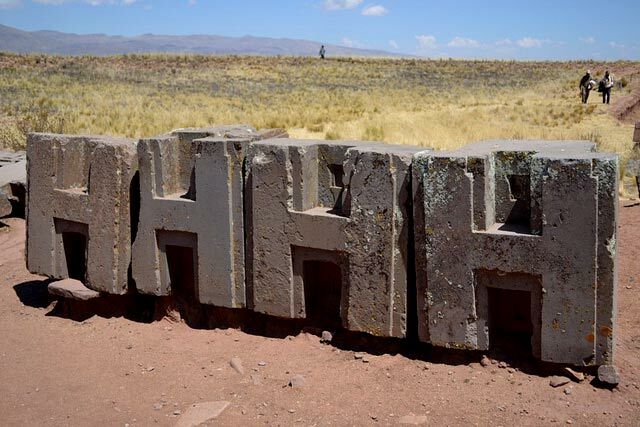 Here are only a few examples of thousands of sites scattered all over the world. 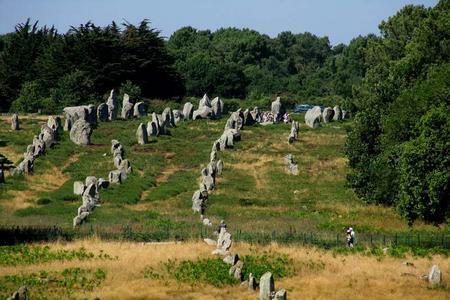 There are about 3000 menhirs in 10-12 rows in Carnac. 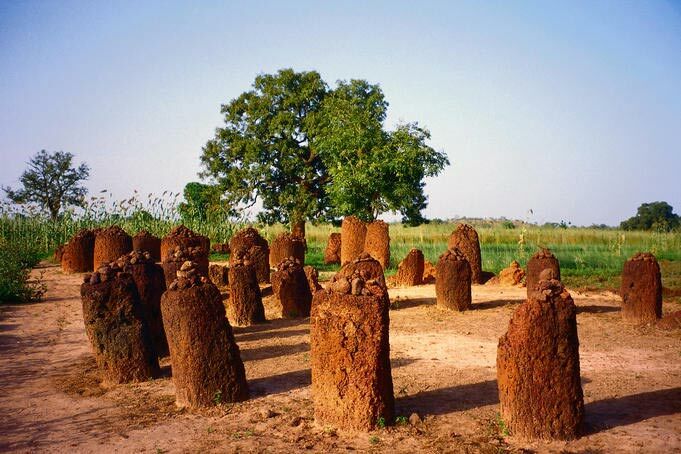 Why would primitive man erect so many stones with bare hands? It is already hard enough in primitive times to make a living off the land. Apparently Carnac is a highly charged place of telluric energy. Each stone taps into this energy and together they provide tunnels or corridors of energy that charge you up as you walk through it. The Atlanteans were highly knowledgeable about the earth’s energy, and megaliths are almost always associated with these energies. A sort of acupuncture of the earth for the benefit of both nature and man. 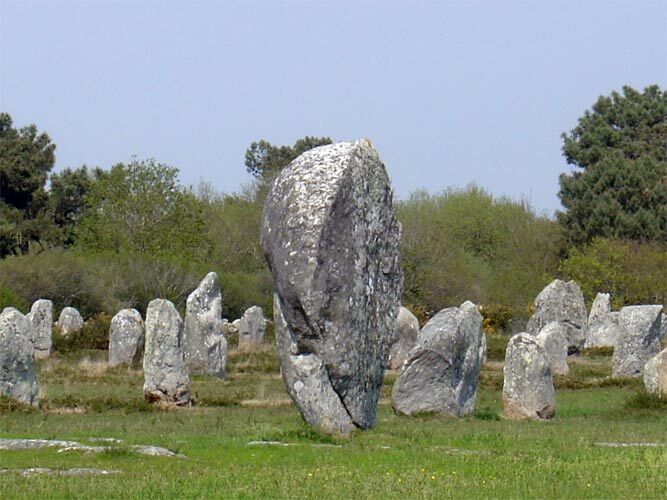 The menhirs at Carnac have one flat side and one round side making them polarized. Granite, from which the stones were made, is also highly magnetic. 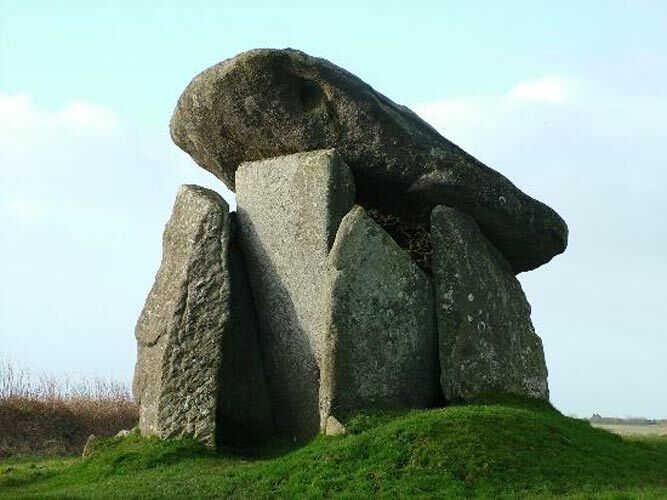 The cut side is always in north-south axis; and the stones have a pointed top.What appears to be a roughly cut stone, always turns out to be a well defined, premeditated form of which every angle, shape or slant has a purpose. 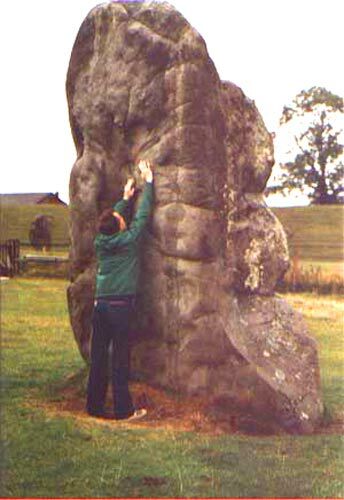 Here you can see me at Avebury, England. One of the stones has two outcroppings were you can place your hands and feel energy coming from it. The stone circles of Avebury, with its truly massive stones, are truly an experience. The Hurlers at Bodmin Moore, South England. Three stone circles with diameters around 35m are grouped together on a moor. When I first entered the site, it looked very unimpressive. But after a while you start to get some sense of it. There are also two nicely cut standing stones outside the circles, and between those two stones flows some form of focused energy. Also, we wouldn’t have noticed it, if it wasn’t for one member of my group who was trained in wicca: outside one of the circles was a flat stone, looking like it was just a natural outcropping of rock. But this flat stone had a small pointed ‘bump’ on one of its corners (left bottom corner on picture). The wicca lady told us that this was done on purpose and ‘outcroppings’ like this are like ‘taps’ from which you can draw the earth’s energy. 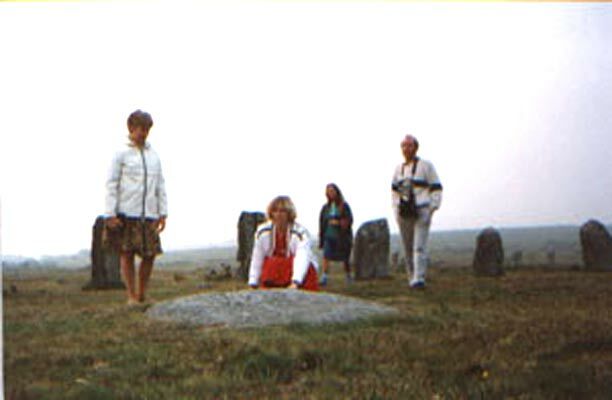 The wicca lady cast some runes on it, and another member of the group noticed a powerful energy shooting up out of the stone. The Atlanteans didn’t leave instruction manuals on how to use these sacred sites, so we have to find it out on our own. A well preserved and impressive chamber tomb, with a dramatically sloping capstone. 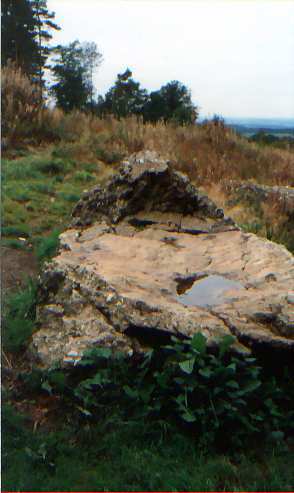 The capstone has a natural hole which pierces the stones highest point. La Roche aux Fées, Esse, France. This is a large structure made of stone slabs, with many antechambers leading to a large central chamber in the back. Originally it was covered with soil with only the entrance showing. This was definitely used for initiations. 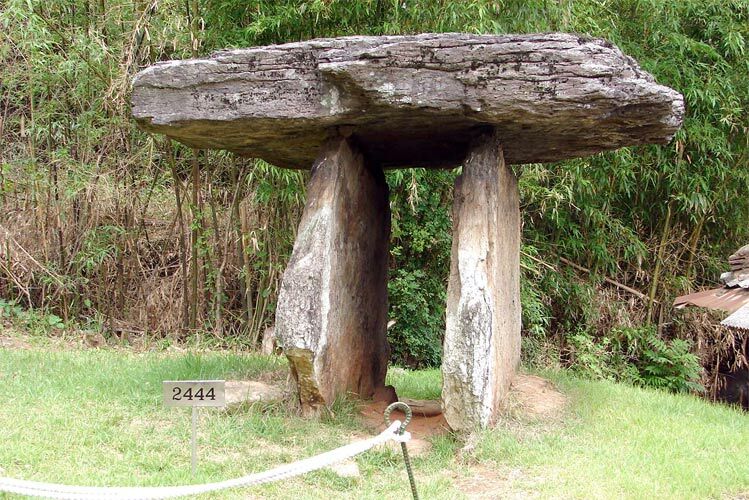 A dolmen in Russia, with very flat tab like stones.The number of known megaliths is up to 3000 dolmens and other structures in North-Western Caucasus. 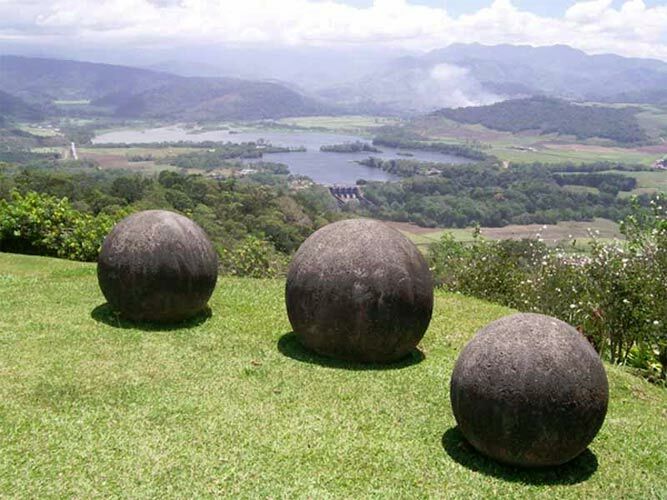 I should also mention the solid stone spheres (over 300) that have been found in Costa Rica. They have been found in clusters of up to twenty, and often in geometric patterns such as triangles, rectangles or straight lines. Such alignments often point to the earth’s magnetic north. The spheres vary in size from four inches in diameter to eight feet round, and some of the stones weigh sixteen tons. The spheres were made of granite, which, as I mentioned before, is a a highly magnetic stone. The quarry was the summit of the Talamanca mountain range more than 50 miles away from the final resting place of these mysteries. 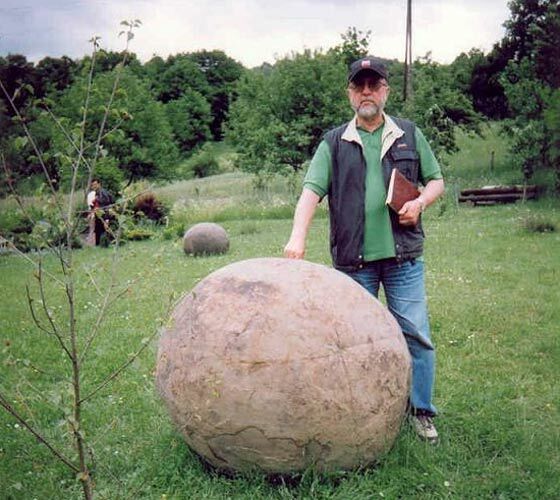 Stone spheres are now being found in Bosnia too. At Nan Madol, a small island complex in Micronesia, some 400,000 columns of basalt are stacked, around 10 tons each. The massive basalt logs are stacked to form walls as high as 50 feet and as thick as 17 feet. 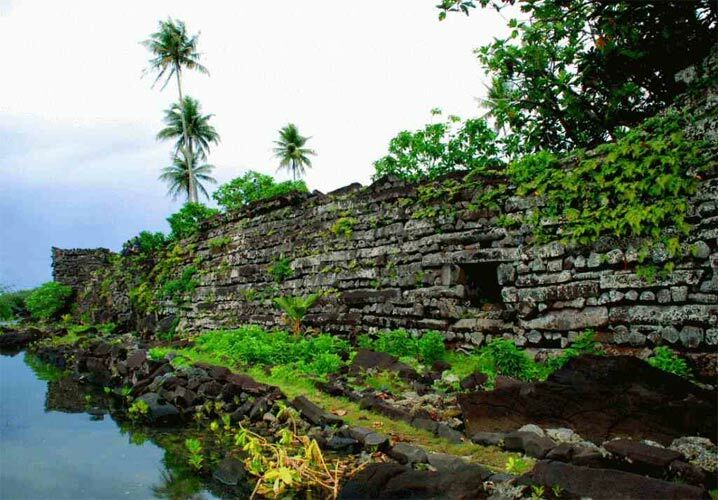 Nan Madol is a strange stone architecture built up on a coral reef. They are actually 80 artificially built islands. Why would some local people decide to quarry 400,000 stone columns and stack them up? If you ask me the artificial islands were made by very knowledgeable people, who also had the technology to transport all these heavy columns. 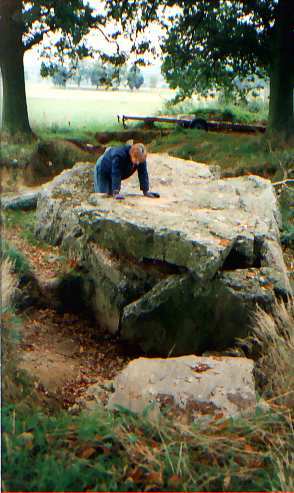 The Devil’s Bed at Weris, Belgium. The Devil’s Bed at Weris, Belgium. All the megaliths in Weris are made of puddingstone which is very hard and full of hard pebbles. The flat stone is bowl shaped and polished. It would like to see who can now polish such a stone, and yet it has been done. 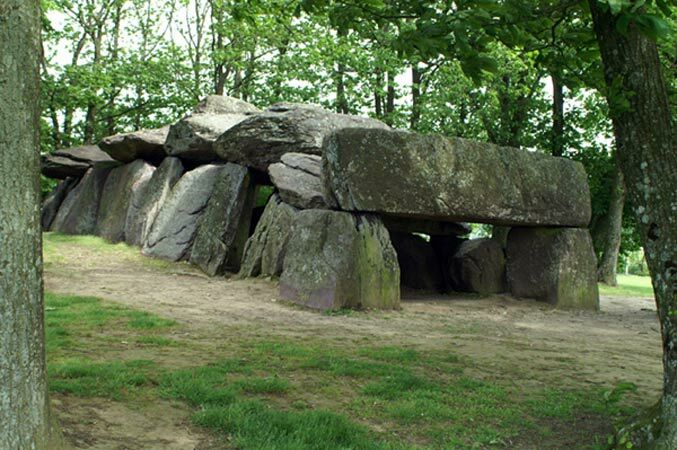 Allee Couverte Sud, or Southern Dolmen at Wéris, Belgium. 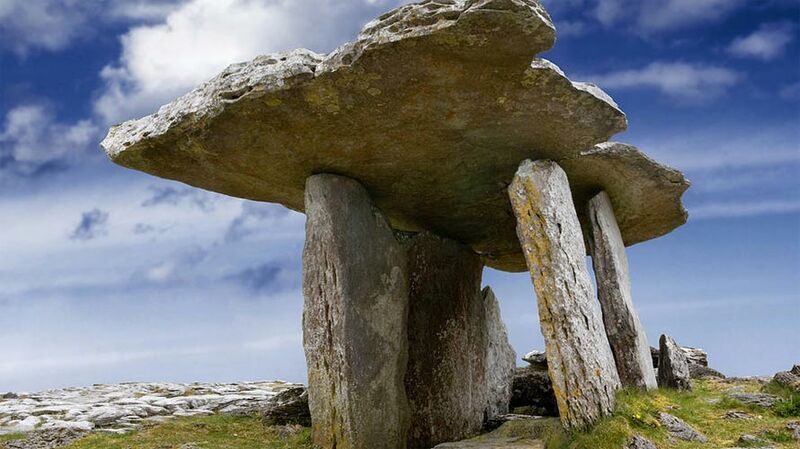 The polished stone of the Southern Dolmen is at the bottom of the picture. On the picture you can slightly see the multiple lines of the direction in which the stone was polished. They run upwards and slightly to the right. When one lies on the stone, one can feel energy running in this direction. 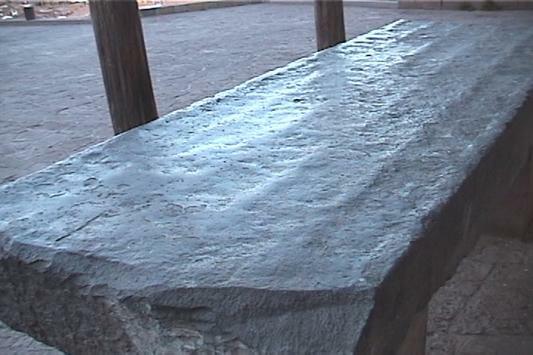 The following picture shows an ancient, heavy and hard stone slab in San Cristobal, Cusco, Peru, which is also polished. If I remember it right, it is made from granite. These are the gigantic stones forming a portion of the so-called Sun Temple. The wall was constructed with huge red porphyry (pink granite) boulders, they consists of six enormous stone blocks which average weight is about 90 tons and have as vertical joints some other smaller stones. The stone quarry is named Kachiqhata (Salt Slope) and is located about 4 km (2.5 miles) away on the other side of the valley, by the upper side of the opposite southwestern mountains. These huge stones were cut in the quarry, transported down the mountain, over a river, and up a mountain. They make us believe that it was down with thousands of people pulling on ropes (would you volunteer? ), where did we hear this before? 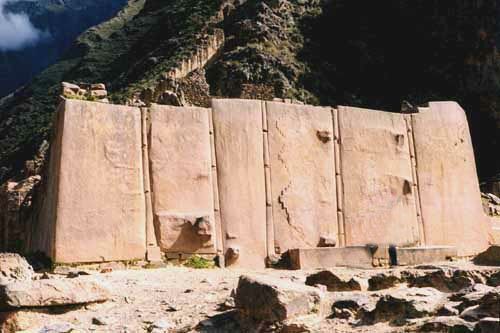 Like Wéris in Belgium, work in Ollantaytambo also suddenly came to a halt, and the supposed temple was left unfinished, with many megaliths left behind between the quarry and the temple. 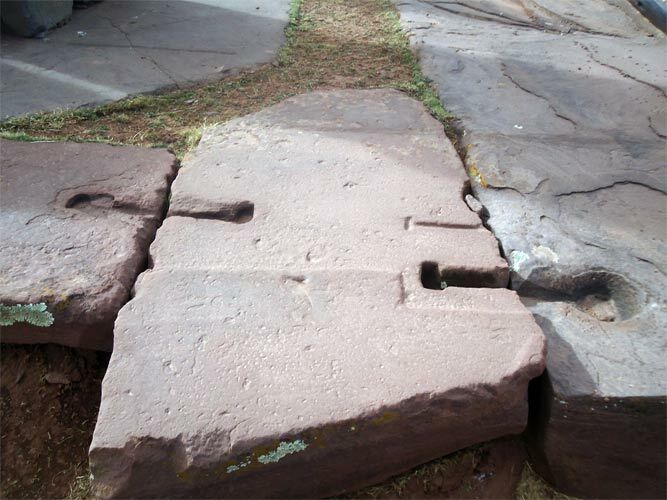 In nearby Sacsahuaman, one find similar megalithic stones fitting so closely together that you cannot fit a knife in between. The irregular fashion with which they fit together makes for a solid, earthquake proof construction. 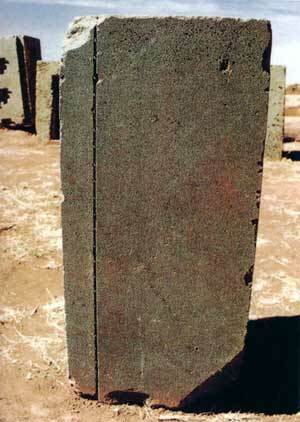 Puma Puncu, a multiton, perfectly level stone slab. 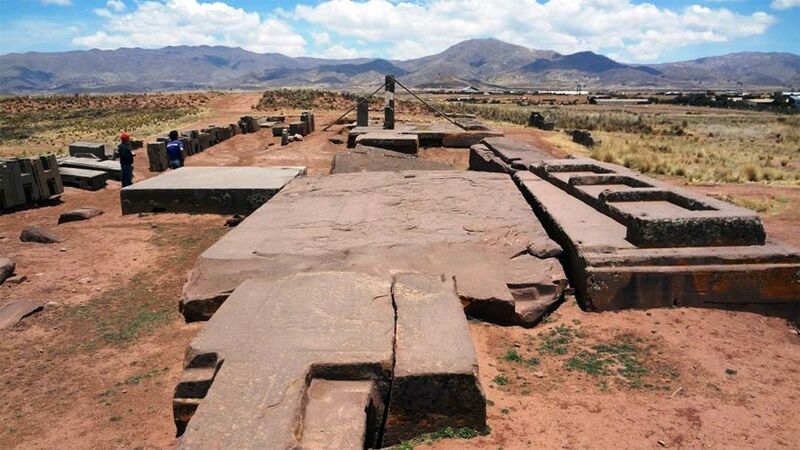 Puma Puncu (close to Tiwanaku), Bolivia, is another strange place, left over from Atlantean days. At present it is just a jumbled heap of stones, as if destroyed by a violent natural catastrophe. One of the largest buildings was made of stone slabs that were up to 26 feet long and 16 feet wide. 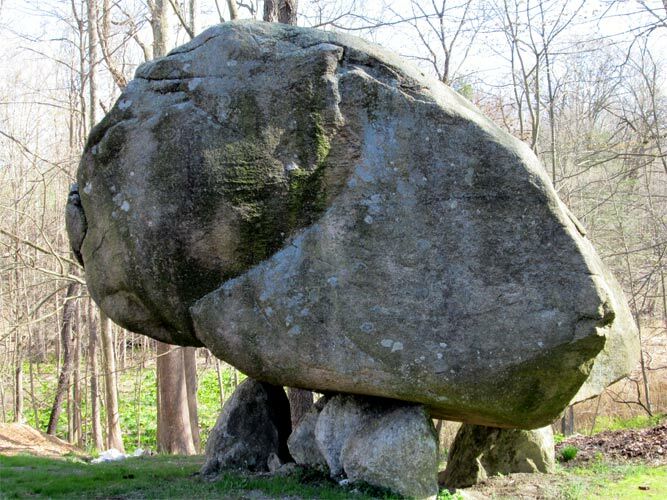 Some stones weight up to 400 tons. 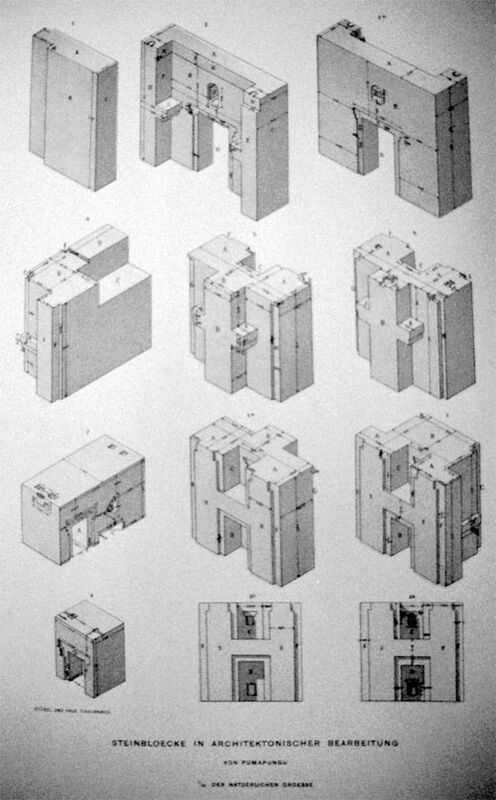 The complicated designs of these blocks, all with right angles and level, and smooth. Some of the stones are very complicated in design, and were made in such a way that the stones had to be slid into each other, in order to latch and form a sturdy wall. Again, it is easier to built yourself a large house out of wood, than to cut and erect big and heavy stones. The complicated shapes which had to made with great accuracy, and the fact that they had to be moved in such a way that they locked into each other in particular ways points again to great architectural knowledge, machinery to cut, shape and lift the stones into place. This stone at Puma Punca contains a perfectly straight groove of 6 mm wide the entire length, plus some equidistant holes drilled into it. 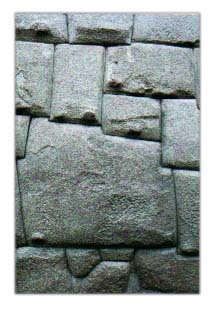 Stones at Puma Punca (also at Ollantaytambo) were held together by these joints into which a metal was poured, serving as a clamp. Apparently the clamps were made of copper, which is too soft to serve as a clamp. The only reason for these clamps is either symbolical or energetic. 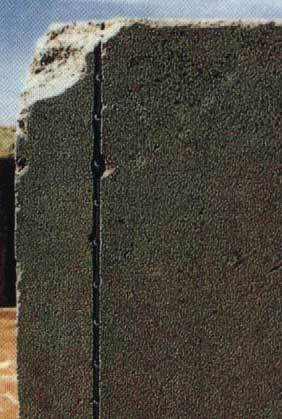 Clamps were also used in Ollantaytambo (Peru), Tiahuanaco (Bolivia) in Denderah (Egypt) and Angkor Wat (Cambodia).